Argentina Attacks (& misses) | Flickr - Photo Sharing! Football! It's a religion of it's own. True fans most probably have a whole different set of chemicals that flow in their brains which are no where to be found in anyone who is not a fan of football. Like they say, "Every four years, a ball does the impossible." parkob, tomatosoup74, and 25 other people added this photo to their favorites. Hi, I'm an admin for a group called Pitch Invasion, and we'd love to have your photo added to the group. This photo was recently featured, with a credit, on the football culture Pitch Invasion. Should you have any questions or concerns about this use, please contact the Pitch Invasion editor. It ´s a pretty shot, it ´s emotive and fascinating sensation. 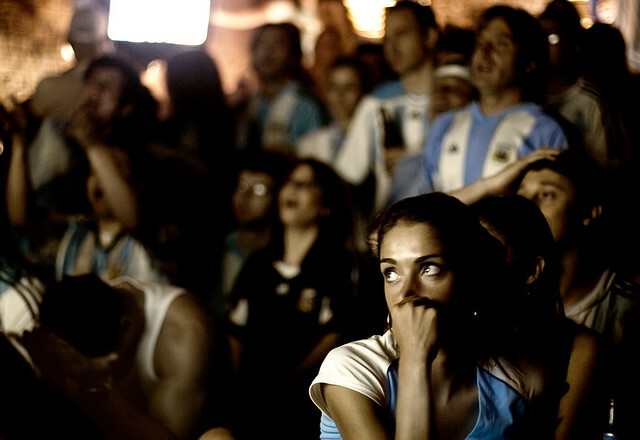 I ´m Argentine and a crazy fan of footbal, and this photo shows the sensation, the nervous while the fans enjoy watching our football team. Congratulations!! !